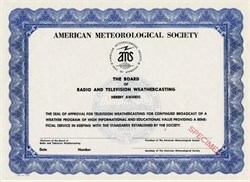 Beautiful Specimen certificate from the American Meteorological Society - Board of Radio and Television Weathercasting. This historic document has an ornate border around it with a vignette of the AMS logo. The American Meteorological Society was established in 1919.